The Red Horns Division located at Rangia, organised an Ex Servicemen Rally on Sunday at Mangaldai, Darang district, which was attended by over 500 Veterans and a number of War Widows and Veer Naris. The event was attended by Maj Gen PS Behl, GOC Red Horns Division and Brig Manish Pande, Cdr Red Horns Artillery Bde, who interacted with the Veterans, war widows, Children and in particular facilitated the Veer Naris. Numerous events such as ECHS awareness, banking services and awareness of government schemes were organised and in particular issues related to outstanding pensions/ other entitlement were resolved. Camaraderie and brotherhood amongst the soldiers is an essential battle winning factor and the Indian Army since ages has been known for the deep bonds of brotherhood and espirit-de-corps that exists within the organization. Not only is this battle winning factor anchored amongst the ranks and file of the Armd forces while they are serving their country but endeavour is made to ensure these bonds continue to exists post retirement also. 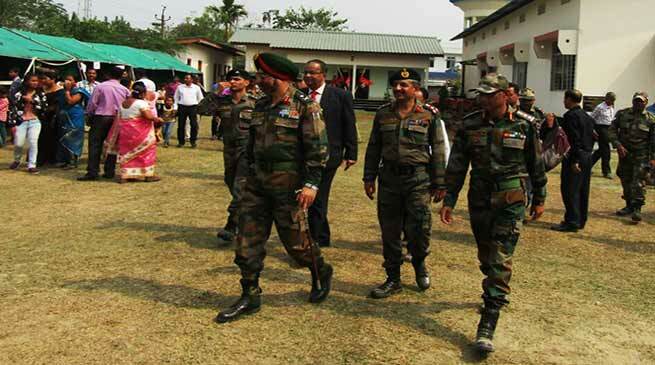 Conduct of Ex Servicemen rally is one such important event organised on regular basis all over the country and in Assam numerous such rallies have been conducted in the past wherein the Ex Servicemen have participated whole heartedly.